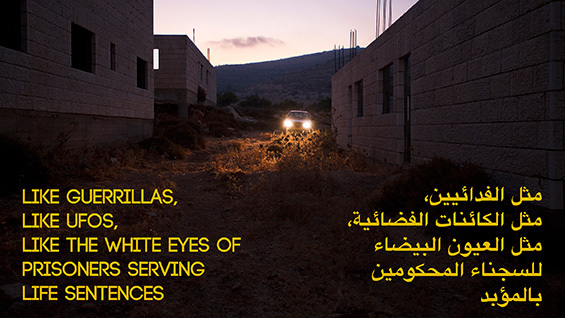 In a free and public presentation entitiled, "In some lost fold of the past we wanted to be lions but we were no more than castrated cats," Ruanne Abou-Rahme and Basel Abbas will discuss and unfold some of the research that shaped their most recent project, "The Incidental Insurgents." "The Incidental Insurgents" is a three-part project that unfolds the story of a historical-aesthetic search for a new political language and imaginary. Over the past three years, Ruanne Abou-Rahme and Basel Abbas have woven together a multi-layered mixed media project, with chapters completing and complicating each other. Multiple texts, largely drawn from the writings of Victor Serge and Roberto Bolaño, alongside manifestos, memoirs, testimonies, and text written by the artists, are sampled and re-pieced together to form an altogether new script. Two of the central chapters of the project are a projection of the artists’ studio and meeting space - spaces where the process of making the project unfolds and where the slippages between actuality and projection, life and fiction, history and myth-making are explored. A staggering array of images, screenshots, video stills, ‘archival’ material, drawings, sketches, plans, storyboards, objects, sounds and texts are sampled and recast into a contingent ‘script’ about a literal and literary trip. From the density of material emerges a central figure: ‘the incidental insurgent’. Part bandit, part rebel, part vagabond, and part artist; a composite figure that functions not simply as a form of social critique, but appears as an incidental historical subject; or, a kind of accidentally revolutionary figure that, by virtue of its very way of life, sits at the threshold between a political order and its waning ideological aura. As the project unfolds, and the figure is recast through different characters, historical and imagined, new threads emerge that lead to both expected and unexpected places, deadly serious and deadly playful all at once. For their lecture at Cooper Union the artists will explore the seemingly disparate coordinates that make up "The Incidental Insurgents:" the early anarchist life of Victor Serge and his contemporary anarchist-bandits in 1910s Paris; Abu Jildeh and ‘Arameet and their bandit gang involved in a rebellion against the British in 1930s Mandate Palestine; the artist as the quintessential bandit in Roberto Bolaño’s novel The Savage Detectives set in 1970s Mexico; a vanguard political publishing house in 1970s Jerusalem and the artists themselves in present day Palestine. Basel Abbas and Ruanne Abou-Rahme (b.1983) work together across a range of sound, image, text, installation and performance practices. Their practice probes a contemporary landscape marked by seemingly perpetual crisis and an endless "present," one that is increasingly shaped by a politics of desire and disaster. They have been developing a body of work that questions this suspension of the present and searches for ways in which an altogether different imaginary can emerge. In their projects, they find themselves excavating, activating and inventing incidental narratives, figures, gestures and sites as material for re-imagining the possibilities of the present. Often reflecting on the idea of returns, amnesia and deja vu, and in the process unfolding the slippages between actuality and projection (fiction, myth, wish), what is and what could be. Their practice, largely research based, frequently investigates the spatio-temporal resonances of seemingly disparate moments. Overwhelmingly their approach has been one of sampling materials (both existing and self-authored) in the form of sound, image, text, objects and recasting them into altogether new ‘scripts’. The result is a practice that investigates the visceral, material possibilities of sound, image, text and site, taking on the form of multi-media installations and live sound/image performances. They have exhibited and performed internationally and founded the sound and image performance group Tashweesh. Solo exhibitions include ICA (Philadelphia), Office for Contemporary Art (Oslo), Carroll/Fletcher (London), Akademie Der Kuenste Der Welt (Cologne), New Art Exchange (Nottingham), Delfina Foundation (London) and group exhibitions at Kunsthalle Wien (Vienna), Museum Of Modern Art (Warsaw), ICA (London), the 12th Sharjah Biennale, the 31st São Paulo Biennial; the 10th Gwangju Biennale; the 13th Istanbul Biennial; the 6th Jerusalem Show; HomeWorks 5 (Beirut); , and Palestine c/o Venice at the 53rd Venice Biennale. They have held performances at The Hammer Museum (Los Angeles), House of World Culture (Berlin),Tanzquartier (Vienna,),Serpentine Pavilion (London), 4th Guangzhou Triennial (Guangzhou), TBA21 (Vienna), De Balie (Amsterdam),Beirut Art Centre (Beirut), Danish Film Institute (Copenhagen) and CCA (Glasgow). They were fellows at Akademie der Kunste der Welt in Cologne in 2013 and artists in residence at the Delfina Foundation, London in 2009. Ruanne and Basel are recipients of the Sharjah Biennale Prize in 2015 and The Abraaj Prize in 2016.